The statewide half-day bandh call given by the ruling SAD-BJP alliance in protest against the recent rise in the prices of petrol, diesel, kerosene oil and LPG evoked a mixed response across the state today. Shops in Abohar open despite bandh call. The Medium Industries Development Board has decided to increase the floor area ratio (FAR) of industrial plots to 1:2 (allowing 10 per cent area for commercial use) and to simplify the procedure for conversion from leasehold to free-hold. Seven years after the Punjab State Transport Commissioner (STC) allowed the plying of private buses on national highways in the state, the Punjab and Haryana High Court today virtually applied brakes on the practice. Non-resident Indians are being actively wooed by parties in the state which goes to assembly polls in eight months. Senior vice-president of the youth wing of the Shiromani Akali Dal (SAD) and president of the Moga Municipal Council Barjinder Singh Brar, who is son of former minister Tota Singh, has begun to reach out to the people in the town and surrounding villages. He is among several aspirants for the party ticket for the Moga assembly seat. To dispel the impression that there was a dichotomy in the thinking of the AICC and that of the PPCC on the anti-Sikh riots, party incharge of Punjab affairs Gulchain Singh Charak today said those guilty must be punished and the law must take its own course. Former Punjab Finance Minister and president of the Peoples Party of Punjab Manpreet Badal here today said Punjab would be debt free within 10 years once his party comes to power. The irrigation authorities have started working round the clock to tackle the choking of canals, distributaries and minors in a major part of the Malwa region including Ferozepur, Muktsar and Faridkot districts. Though the concentration of hyacinths entering into the canal distribution system in this region has not acquired alarming dimensions so far, it has become a major headache for the irrigation authorities as it has been choking some important points. Work by the drainage department on strengthening the dhussi bundh along the Sutlej at the Tajowal complex is moving at a snail’s pace. Also, government funds for the same are rather meagre. Villagers in the bet area apprehend that they may not escape the fury of floods this season. The water level in the Bhakra dam crossed the 1,600 ft level today. This level was recorded on July 28 last year. It is 80 ft below the danger mark. The Pong Dam too has registered a high water level as compared to last year. With the monsoon predicted to be normal this year, the possibility of floods in areas along the Sutlej has increased. The irrigation and drainage authorities have failed to execute flood prevention measures, leaving those residing in flood-prone areas in panic. The authorities concerned could not find stones to erect studs in the Ghaggar flowing through Mansa district to restrict its flow. A retired superintending engineer (SE) from the erstwhile Punjab State Electricity Board (PSEB), Gurnek Singh Brar, has filed a petition in the Punjab State Electricity Regulatory Commission (PSERC) against the Punjab Government for its failure to make advance payment of subsidy to the Punjab State Power Corporation Limited (PSPCL) as directed in the commission’s tariff order of 2011-12 issued on May 9, 2011. Surveillance cameras installed in the Golden Temple complex have helped security and police to identify a hundred men, women and children who had made the complex their home. Constructed 12 years ago, Sri Dasmesh Martial Arts Academy opens tomorrow with 55 residential students and 28 day-scholars. The Sports Department of Punjab will run this academy for which three coaches have been hired for now. 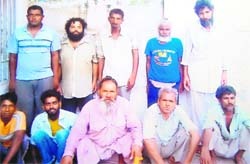 District sports officer Harmeet Singh said the football coach at Ropar had been asked to instruct the academy students till a new coach was found. The delay in issuance of the detailed marks certificates of the Class XII by the Punjab School Education Board (PSEB) is causing a lot of inconvenience to the students. The Bhadson police has registered a murder case against two persons for allegedly killing a local resident, following the victim's denial to give his motorcycle to them. A case under Section 302 and 120-B of the IPC has been registered and the cops have arrested the accused. While markets remained closed at several places, shops and other business establishments in a few other areas functioned normally during the bandh period. No incident of violence was reported from anywhere in the state. SAD president and Deputy Chief Minister Sukhbir Singh Badal, however, claimed that the bandh was a “success” and thanked the people, particularly the traders, shopkeepers, industrialists and other businessmen, for their “cooperation”. Sukhbir, in a statement, claimed that Centre “should read the writing on the wall”. Ludhiana: It meant business as usual for businessmen in major markets like Ghumar Mandi, Mall Road, Kitchlu Nagar, Pakhowal Road, Model Town and Sarabha Nagar. The traders and industrialists, too, did not pay heed to the bandh call. Though the industrialists are directly affected by the rising prices, they said the state government should first solve pending issues like VAT refunds, decreasing VAT on petrol and reducing power tariff. However, a few shops in the old city areas, including in Chaura Bazar, Gur Mandi and some adjoining markets, did remain closed but not before the SAD-BJP leaders went to the shopkeepers and persuaded them to down the shutters. Bathinda: Not many traders in the home district of Chief Parkash Singh Badal obeyed the SAD-BJP call for bandh, though a few shops could be seen closed in some parts of the city. The bandh's impact remained restricted to only those markets, including Hospital Bazaar, Dhobi Bazaar, Sirki Bazaar and Post Office Bazaar, where the SAD-BJP leaders held gatherings. The buses plied normally even during the bandh hours. Amritsar: The call for bandh evinced a lukewarm response in the holy city. In several areas, even the SAD workers and leaders were found absent from the protest. 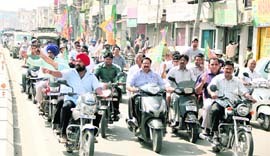 BJP activists, led by Youth Development Board Vice Chairman Tarun Chugh, carried out a scooter and motorcycle march through various commercial areas of the city. At many places, the protesters were seen forcing shopkeepers to close their shops. Jalandhar: The bandh appeared quite "ineffective" in the city. While most of the commercial establishments around bus stand and other prominent places did not close at all, those that did — in Rainak Bzaar, Model Town, Jyoti Chowk, Patel Chowk, Sheikhan Bazaar and Mai Hiran Gate markets — opened after an hour or two of closure. About the bandh's "ineffectiveness", a BJP leader said that he had sent a message to all shopkeepers and even tried to convince them to down shutters but also pointed out that his party workers did not want to force the bandh on the public. Meanwhile, District Congress Committee (urban) president Arun Walia termed it as one of the most "ineffective" bandhs ever. Patiala: The Shiromani Akali Dal workers allegedly forced a few shopkeepers to close their establishments here. While commercial establishments, including shops and corporate offices, in SAD-dominated areas remained closed, those in other areas, which are sparsely populated, were open. Later, Akali activists, led by SAD general secretary Prem Singh Chandumajra, took out a procession in the city. Later, BJP workers also organised a protest. Pathankot: The shutdown was complete in the hometown of former Transport Minister and BJP MLA Master Mohan Lal. Addressing a gathering at the Post Office Chowk, Master Mohan Lal alleged that the hike in petro products had come as an additional burden on the common man. Nawanshahr: Spare the business houses not owing allegiance to any political parties, even the shops owned by SAD-BJP leaders failed to observe bandh. Though local SAD MLA Jatinder Singh Kariha and party district president Mohinder Singh Hussainpur had, at a press conference on Saturday, claimed that the bandh would be successful, it appears that no programme for translating the idea into action was planned. 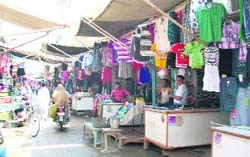 Nakodar: Majority of the business establishments, shops and other commercial establishments remained open except for a few shops in some areas, including in Shahkot. The shopkeepers said they condemned price rise but also pointed out that resorting to bandh would only mean losses to them. Moga: The call for bandh hardly had any impact in Moga and Faridkot districts. While life remained undisturbed in the towns and villages, business and commercial activities remained open throughout the day. The traffic on the roads was also normal. The attendance in educational institutes that re-opened after summer vacation was also as usual. Phagwara: The bandh saw partial response in Phagwara, Goraya, Phillaur, Apra and Bilga on Monday.While the shops in interior areas of these towns remained closed, the commercial establishments on the outskirts functioned normally. These decisions were taken at a meeting headed by Industries Minister Tikshan Sud here today. The minister constituted a committee consisting of senior officers from Punjab Small Industries and Export Corporation (PSIEC), Punjab Urban Development Authority, mayors and councillors from Patiala, Ludhiana and Jalandhar to examine the issue and submit a report in 60 days. It was decided to allow a maximum of 10 per cent of the total area of the allotted industrial plots as showrooms/factory outlets for display/sale of products. No land use charges will be imposed. It was decided that PSIEC would do away with the practice of obtaining an undertaking from the allottees regarding zoning violations at the time of registration of conveyance deed and conversion of plots. In case of plots mortgaged with financial institutions, the latter would return the lease deed to PSIEC if the allottees wanted to convert their lease-hold plots to free-hold plots. On conversion of the plot, the corporation would issue an NOC for mortgage of plots without much ado. It also ruled that the Transport Department and Pepsu Road Transport Corporation seemingly were “hand in glove with private operators” and directed the state chief secretary to constitute a high-level committee to probe the delay in challenging the STC orders and also the appellate tribunal orders upholding the same. The directions are significant as private operators apparently gained mileage from the delay and continued to ply their buses in the interregnum. Ordering a stay, Justice Alok Singh referred to the record in a case filed by Pepsu against Ambala Bus Syndicate Private Limited and three other private operators to state that the STC granted four permits vide impugned order dated January 2, 2004. These were for plying buses with a return trip on the Mohali-Nangal via Kharar-Kurali route. Justice Alok Singh observed the route map revealed the 70 km-long Kiratpur Sahib-Mohali stretch was part of the national highway. Justice Alok Singh also asserted: “Record reveals that the State Transport Appellate Tribunal passed the impugned order on February 14, 2007, while the STC passed the impugned order on January 2, 2004. “The present petition was filed after much delay on May 30, 2008, and defects pointed out by the Registry were not removed for three long years and were ultimately removed on June 3, 2011. “It seems that the Transport Department, as well as Pepsu, were hand in glove with private operators and because of their action/omission, private operators were plying their vehicles on the route causing sufficient loss to the department”. Before parting, Justice Alok Singh took note of assurance by state counsel on the compliance of the order. “She has further assured that no operator shall be allowed to ply their vehicles on the basis of the impugned order stayed by this court”. The Election Commission of India recently conferred voting rights to NRIs and a large number of them could turn up to cast their votes. The Congress, the Shiromani Akali Dal and the newly formed Punjab Peoples Party headed by Manpreet Badal know the importance of NRI votes. Taking the lead in the matter, senior leader of the Congress Rajinder Kaur Bhattal has urged the All-India Congress Committee to discuss with the Election Commission and find a way by which NRIs can cast their votes without leaving their countries of work. “All of them cannot come to India in one go to vote during the February 2012 polls,” said Bhattal who is on a visit to the New Delhi. The party aims to send Punjab Congress chief Amarinder Singh and Bhattal to visit nations where Punjabis live in large numbers like Italy, the UK, the USA, Canada and Australia. Meanwhile, PPP’s Manpreet Badal has made his voice heard on the issue of racial attacks on Indians in countries like Australia and has been meeting delegations of NRIs to find his space among the moneyed and vocal lot of Indians who live abroad. Punjab DGP Paramdip Singh Gill is also eying the SAD ticket from Moga. But he has several disadvantages - his father was a Congress MLA, he has hardly stayed in Moga in the past 20 years and he is an officer of the J&K cadre with plans to establish business at Sambha near Jammu post-retirement. Nevertheless, a cousin of the DGP, Dr Micky Gill, has organised hundreds of mass contact functions for the DGP in the area. The police officer claims he has been assured of a ticket by Sukhbir Singh Badal, Deputy Chief Minister and president of the SAD. Tarsem Singh Rattian, chairman of the district planning board, is also an aspirant for the party ticket. Nidharak Singh Brar, a former youth leader, has joined hands with former Finance Minister and PPP chief Manpreet Singh Badal and hopes to get the party ticket for Moga. Manpreet was in Mandi Gobindgarh to meet industrialists and listen to their problems. He said efforts should be made by the state government to provide low-cost power for the industrial sector of the state. He said that electricity was going to be surplus in the coming five or six years in all the states of the country, which would give an impetus to the industry’s growth. Members of different organisations, including Steel Chamber of Commerce and Industry, All-India Medium and Small Scale Re-rollers Association and members of the Punjab Beopar Mandal met him at the Gobindgarh Club Limited. The irrigation authorities have started working round the clock to tackle the choking of canals, distributaries and minors in a major part of the Malwa region including Ferozepur, Muktsar and Faridkot districts. Though the concentration of hyacinths entering into the canal distribution system in this region has not acquired alarming dimensions so far, it has become a major headache for the irrigation authorities as it has been choking some important points. The Irrigation Department authorities had to send an SOS message to the Punjab Government last year, when hyacinths had blocked almost all the irrigation channels in a major part of the Malwa region apart from causing breaches, to send funds to deal with the situation. The problem became so severe that the state government released funds under the calamity relief fund (CRF) last year. This problem is not so prominent in the irrigation channels of Upper Bari Doab Canal (UBDC) system and Ropar canal distribution system. Baljit Singh Sandhu, Superintendent Engineer, Ferozepur, while claiming that the situation was comfortable this year as compared to last year, said that hyacinths had been causing blockage at the Bengaliwala head on National Highway 15, at 44 RD at Ferozepur feeder, Gurdita Wala head and 21 RD of the main canal of Eastern Canal distribution system. 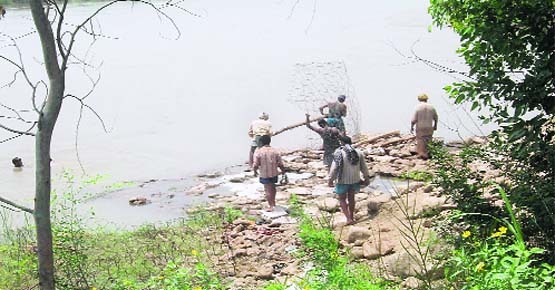 Men and machines have been deployed to clear the blockage so that the flow in important canals including the Ferozepur feeder, Sirhind feeder, Gang canal and Rajasthan feeder could be kept smooth. Every day, tonnes of hyacinth are being removed from different points, he added. He said that the hyacinths, growing in Budha Nullah and Kali Bein, have their outfall in the Sutlej. From the Sutlej, these go into various canals originating at the Hari Ke barrage and Ferozepur feeder. A cross section of the field staff of the Irrigation Department, who man different irrigation channels in the region, expressed fear that breaches could take place in the canals, distributaries and minors any time for two main reasons. First, they point out that hyacinths had been blocking the smooth flow of water in the irrigation channels. Secondly, farmers had been stopping the supply of water to their fields by closing the outlet of irrigation channels as demand of water had gone down due to rains which had been lashing the region continually. These factors had been raising the level of water in irrigation channels in certain areas, which if not tackled in time, could lead to a breach, they claimed. The drainage department has prepared an estimate of Rs 8.13 crore for strengthening sensitive points of the bundh but has got sanction for work at two points- the Tajowal complex and the Burj Tehal Dass complex-at a cost of Rs 70 lakh and Rs 35 lakh, respectively, said Balwinder Singh, SDO. “The work on constructing a spur and a revetment at Tajowal has begun but because of scarcity of labour and supply of stones from Lohand Khud, it seems the department will not be able to complete the work by July 15 as directed by the government,” said the SDO. While the drainage department is struggling to meet the deadline, residents of a number of villages fear floods with reports of the water level rising in the Bhakra dam. In 2008, the then Deputy Commissioner Nilkanth Avhad had mobilised the administrative machinery to thwart floods. Last year, led by Deputy Commissioner Shruti Singh and SSP Narinder Bhargav, villagers and NGOs had strengthened the bundh lining along the the Tajowal Complex and the Mirzapur Comple, saving the life and property of a number of villages. To salute the efforts of the the district administration and the local community, Deputy Chief Minister Sukhbir Singh Badal had especially visited the Tajowal Complex last year, promising to undertake a comprehensive survey and release adequate funds for strengthening the dhussi bundh before the onset of the next monsoon. The Bhakra dam inflow has been recorded at 44,084 cusecs, and the outflow (from Bhakra to Nangal) at 29,914 cusecs. As much as 7350 cusecs of water is being released from the Nangal dam into the Sutlej. The BBMB officials say there is no reason for alarm. As per the petition, a copy of which is with The Tribune, the PSERC had informed the Punjab Government through its letter dated April 24, 2011, that the subsidy amount for free power to agriculture, SC and non-SC/BPL domestic consumers was worked out as Rs 4188.92 crore, which is payable in monthly advance installments. “The state government through its letter dated May 5, 2011, had given its acceptance for payment of subsidy of Rs 4,188.92 crore. The commission accordingly issued tariff order on May 9, 2011, incorporating the commitment of the Punjab Government for continuing the free power. However, on May 24, 2011, the Punjab Government issued an order by which an amount of Rs 981.93 crore, pertaining to period prior to September 30, 2001, along with interest, was adjusted against the subsidy amount of Rs 4,188.92 crore,” reads the petition. Brar has stated in the petition that instead of complying with the commission order and making monthly advance payment of Rs 349.08 crore, the government paid only Rs 380 crore subsidy for the months of April and May 2011 and failed to make the advance payment of Rs 349.08 crore for June 2011. He further mentioned in his petition that when the PSERC, in its order of September 13, 2007, had ruled that the subsidy payable by the state government needs to be paid in advance, as per the requirement of the law, the question of adjustment of subsidy towards principal/loans does not arise. “Under the one-time settlement scheme of the Union of India, the outstanding dues of the erstwhile PSEB towards the central sector companies like the NTPC etc were securitised by the Punjab Government through issue of long-term bonds in 2003. These amounts pertaining to period prior to October 1, 2001, were to be discharged by the Punjab Government as stipulated in the tripartite agreement with the Union Government and the RBI. The Punjab Government by violating the agreement has given a revenue shock of Rs 981.93 crore to the PSPCL, which would make the already precarious financial position of the power corporation even more critical. One of them, a man, had stayed the longest, for the past four years. None of them, however, had any criminal record and they were let off after interrogation. The week-end drive, conducted on Saturday and Sunday, will now be a regular feature, informed SGPC member Jaswinder Singh. The drive was prompted by rising incidence of theft and pockets being picked in the complex. Scanning the CCTV footage led to the identification of the one hundred and odd ‘regulars’ who appeared to move around aimlessly. It came as a shock to find some teenagers too who were staying in the complex for the past several months without the knowledge of their parents back home. The Deputy Commissioner of Police AS Chahal told The Tribune, “two children-one from Kotkhalsa and another from Abohar, too were let off after their parents were called up”. The SGPC is planning to instal special wireless CCTV cameras at a stretch from Darshni Deori to the sanctum sanctorum. No camera could be installed earlier due to various technical reasons. To further streangthen the vigil, two-way phones would soon be provided to the security task force to ensure prompt reaction by them, in the event of any untoward incident recorded by CCTV cameras. The students enrolled had to clear the trials conducted at Ludhiana and Anandpur Sahib. Among the residential students are 25 athletes, 15 judokas and 15 boxers. Among the day-scholars are 15 judokas and 13 football players. The academy will spend Rs 120 per day on the diet of its residential students and Rs 60 per day on that of the day-scholars. Players from the Punjab School Education (PSEB) will be enrolled with SGS Khalsa School and those from the Central Board of Secondary Education (CBSE) with Bhai Nand Lal Public School. The academy will also train 26 students of Sri Dasmesh Academy-seven players of archery, five judokas, six boxers and eight wrestling players. Former Defence Minister George Fernandes had inaugurated the academy in 1999. Built on 40 acres at a cost of Rs 25 crore, it was used for hosting the National Games in 2004 and Khalsa Khel Utsav a few years ago. With the Congress assuming power in 2002, the academy remained ignored. In 2007, PUDA carried out maintenance and repair work of the building at a cost of Rs 1 crore.In January last year, a portion of academy was leased out to Anandpur Sahib Foundation to set up residential complexes for its officers. The academy was founded with the aim to encourage rural students to join sports and train them in specific disciplines. The result of the second semester of Class XII was declared on June 6 and even after the completion of almost a month, students still await the marks certificates. Talking to The Tribune, Sarabjeet Kaur, a science student, informed that she had applied for many colleges in Chandigarh and had attached a downloaded copy of the result, along with the form. Gaurav Verma, a commerce student from a local Senior Secondary Model School, said he had to apply for a degree course in Australia, but was unable to do so as he did not have the original certificate with him. “I have visited my school thrice to enquire about the DMC, but they have not arrived yet. I have applied for a few colleges in Australia, but now the problem is that they need my original DMC as many colleges have clearly written that they would not consider us if we do not have our original certificates. I will then have to apply for January batch next year,” he added. One of the school principals further said, “Many parents and students visit the school every day and express dismay, but the matter is not in my hand,” she added. Chairman of the board Dalbir Singh Dhillon said he had already received the printed cards. “The detailed marks certificates are being packed today and will be delivered by tomorrow morning,” he added.